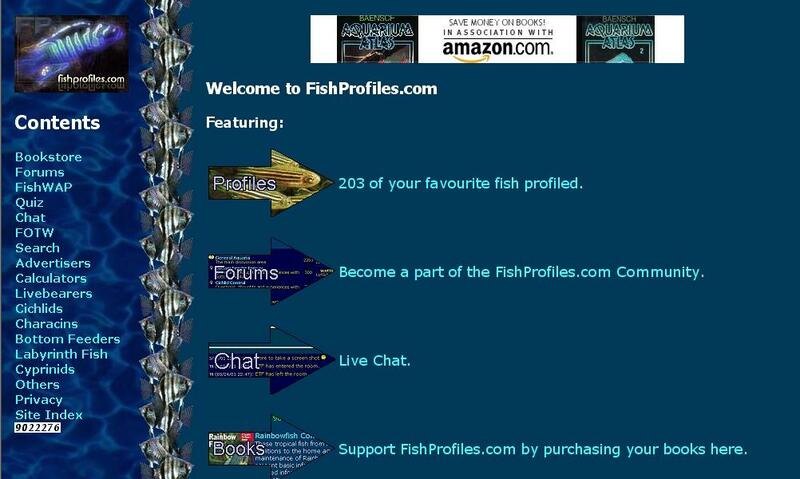 FishProfiles.com has been around in one form or another since late 1997, and over the years we've made a number of changes, including 4 major redesigns. We originally started out as a very small personal site so I could learn HTML, with the only content being a couple of photos and a list of fish kept by myself. We were originally hosted on the free webspace provided by my university, QUT. 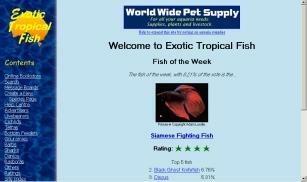 In 1998 the site was redesigned and renamed to Exotic Tropical Fish, but content was still lacking. I needed more space for the site, so we moved to a new company that had just started up, Geocities (http://www.geocities.com/TheTropics/4788). Again, I don't have an image of this site, please email me ( ) if you do. At this point I was starting to expand from my modest 2'x1'x1' tank to another 2'x1'x1' and a 5'x1.5'x1.5'. I managed to talk a wholesaler into providing very cheap prices for bulk orders of fish, so in order to make such a large order of fish possible, I decided to add a pricelist to the site. I organised for all orders to be put together at the end of the month, and this went on for around six months until I grew weary of all the organising around. In 1999 I discovered the subdomain, a very low cost way of having a top level web address. We moved to an excellent web host, Brisbane Internet Technology. At the cost of $5 per month, everything was provided for the new site, www.fish.bit.com.au . After moving on from providing fish at very cheap prices, I decided to moved towards an information site, inspired by my first fish book, and one I still think is the best, Baench's Aquarium Atlas. Initially I set out to provide profiles on all the freshwater species commonly available in Australia. I also commissioned the Help Centre, a group of eight hobbyists that answer questions emailed to them by visitors to the site. 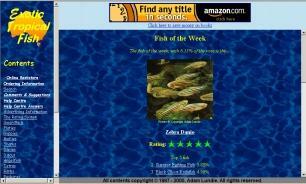 The Fish of the Week was also created, with visitors being able to vote for their favourite fish. In an effort to move away from frames, a new design was implemented. At this point I was just starting to learn ASP, and the use of header and footer include files was about the extent of my knowledge. With the new site, came even more visitors. The Help Centre became very busy, so it was decided to add interactive forums, and a community was instantly developed. With the new forums, came myriads of visitors. In fact, the free message boards in use could not keep up with the traffic. As commercial message board solutions were very expensive at this time, I decided to expand my ASP skills and create my own message boards system. With the new system, came an excellent array of features tailor made for this site. Popularity rose 100x above levels from twelves months before. A new server was required. Before I managed to find the time to find another hosting company, the current host was bought out by Asia Online. The server was upgraded, and was sufficient for the traffic level at the time, although the hosting price was raised from $5 to $35 per month. As the banner advertising was providing an income of approximately $30 per month, I was willing to pay the extra money to keep the site running. Unfortunately for Exotic Tropical Fish, Asia Online was a terrible company, with servers that constantly failed and half hour waiting times for bad technical support. I decided to move on to another company. Just as I was finalising a generous deal with Ilisys that provided a good server at $40 per month, Asia Online went bankrupt. Exotic Tropical Fish was deleted without them giving me any notice! The website was down for about seven days, and it would have been considerably longer had I not already organised an alternative hosting provider and a new domain name. 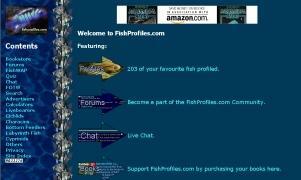 FishProfiles.com was born. As my ASP skills had matured considerably, I upgraded and redesigned the site, adding conversion calculators, a quiz, a chat room, and an updated version of the forums. Over 100 new profiles were added, and popularity again rose above what we could support. The server at Ilisys regularly went over it's 5GB per month limit so rather than take the chance of being handed an excess usage bill, I decided, yet again, that it was time to move on. In mid 2002, I started a small hosting business, ASP Network. I envisaged that FishProfiles.com would need to start making money to survive the cost of the new servers at $250 per month. 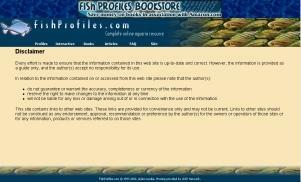 FishProfiles.com, under the trading name of ASP Network, implemented Premium Memberships. 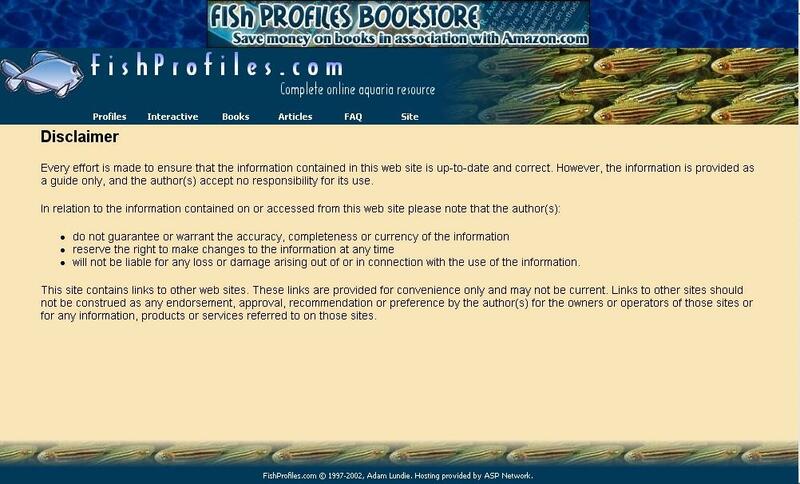 Premium Memberships provided for approximately 50% of running costs for FishProfiles.com. ASP Network providess for around 20% of running costs, leaving myself paying for 30% of the total costs. 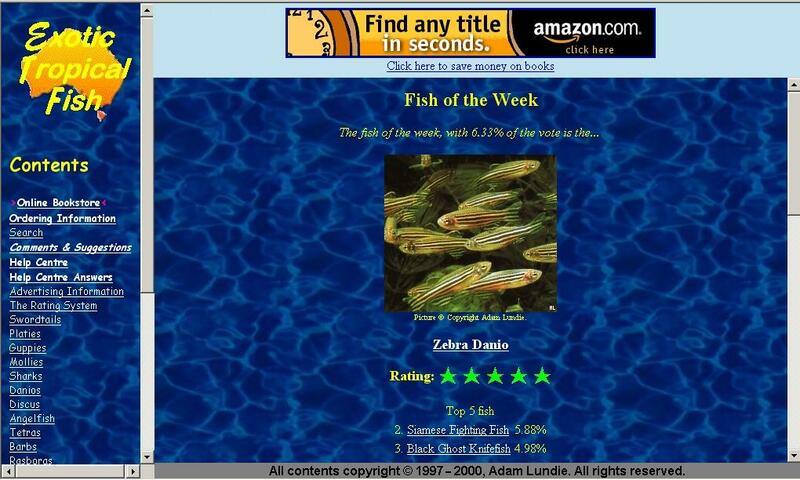 In late 2002, I decided to expand FishProfiles.com to encompass all aspects of the aquaria hobby in a bid move up from #4 to reach #1 in popularity. The new site was published in February 2003.